Do you ever think about a time before air conditioning? It’s tough – we know. Fathomable or not, there was once a time when this glorious invention didn’t exist. So, what creative approaches did people take to stay cool back in the day? Thanks to a few handy sources, we’ve found some very interesting past solutions to beat the heat and the interesting development of AC over time. Have their homes built on hilltops to catch the breeze. Strategically place their windows on opposite ends of each other with a door between them to produce a steady flow of cool wind. Use ice water-soaked sheets and have air blown over them to create cold air. Sleep on their porch at night. Trees. We often think of trees as just shade for outdoors, but that wasn’t the case in earlier days. People would strategically plant trees on the east or west side of their home, (this being where the sun rises and falls), to block out the sun. Transom and Double-Hung Windows. Transom windows sit above doors, which allow hot air to rise upstairs. Double-hung windows allow you to let heat out from the top opening during the day and let cool air in from the bottom opening at night. Reflective Roofs. Using light colored, reflective material to build rooftops made for a significant decrease in the heat absorbed into the home. Have an expert cool your home. In 1904, mechanical cooling was used to cool the World Fair’s Missouri State Building. In 1922, the first well-designed cooling unit, using a technology called centrifugal cooling, was installed in movie theaters. In 1929, a smaller cooling unit was produced but was modified between 1930 and 1931 to create a self-contained room cooler. By the 1960s, new homes were built with air conditioning. As of present day, air conditioning is now found in over 87% of homes. From strategically placed homes and windows, to cooling units being available in establishments, to now being available anywhere, air conditioning is here to stay. We project that the industry will continue to shift towards greener HVAC solutions, and we’ll be analyzing this trend every step of the way. Learn more about your modern day air conditioning solutions – give us a try. It’s not every day that you meet some like Chris James. A dedicated apprentice, an experienced athlete, and a caretaker for breast cancer. This fall, Chris will compete in the very prestigious triathlon, the Ironman. His run will support the Edith Sanford Breast Cancer Foundation. The triathlon will take place on September 25. Explore Chris’ incredible journey through this video. Chris is a fourth-year apprentice with SMART. He made his way to us after being a welder for the Marine Corps. He was intrigued by Local 265 union, the camaraderie, and the benefits that came with being a part of a great organization. He also found a connection to our values of quality and integrity, as he appreciates the quality five-year apprenticeship he’s a part of and carries integrity everywhere he goes, just as the Marines have instilled in him. Thanks to these factors, SMART was the perfect fit for Chris and he’s dedicated himself to SMART and the union ever since. Chris was born in Chattanooga, Tennessee, but spent most of his life in Illinois and Georgia. When he’s not training for the Ironman triathlon, he spends his spare time with his fiancé (who he says he wouldn’t be able to train and do this triathlon without), dogs, and performing gigs. Though this is Chris’ first time competing in a triathlon, he’s an experienced athlete who has participated in everything from 5ks to 100 mile runs, including an extensive Olympic triathlon. His influence to compete in the Ironman derived from seeing it firsthand. He supported his friend during his entire Ironman in Louisville. By being exposed to the triathlon and the amazing spirits of the triathletes, he was completely won over. He says the community even reminded him of SMART. As Chris began his Ironman search, there were some key things that stuck out to him, making it clear that he was meant to do the triathlon. First, he found that Chattanooga was one of the locations. Being that this is hometown, this alone sold him. Unfortunately, as he went to sign up, the Chattanooga triathlon was full. But this didn’t stop Chris. The Ironman also allows people to fundraise for organizations. The organization that stuck out to Chris was the Edith Sanford Breast Cancer Foundation. Choosing this foundation meant more to him than just a means to enter the triathlon, but as a way to support a cause that was near to his heart. 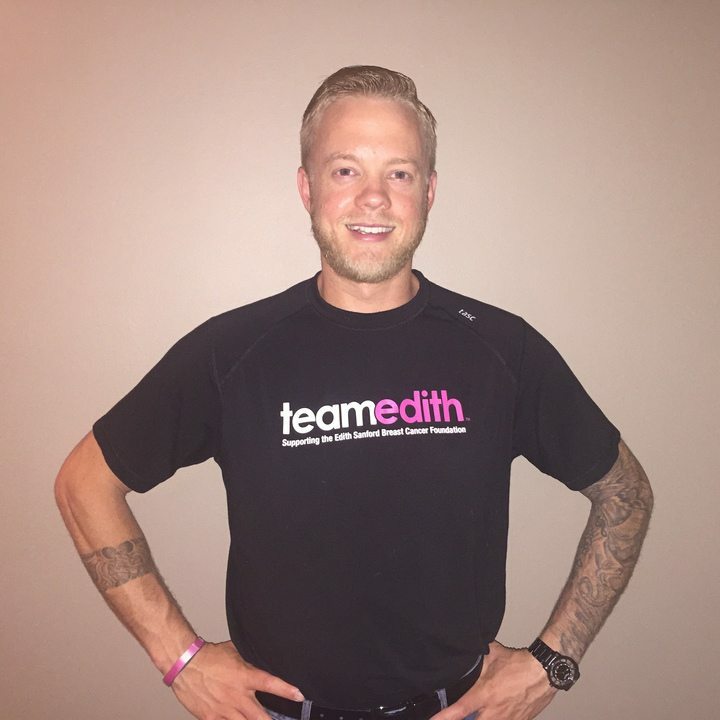 His grandmother passed away from breast cancer, and Team Edith was the perfect way for Chris to help the breast cancer community. Supporting a foundation for the triathlon comes with a huge commitment. The typical registration fee for the Ironman is $700. However, to support a foundation, you’re obligated to raise money for it. Chris’ goal is to raise $5,000, and he must hit a minimum of at least $3,500. So far, he has raised money through music gigs and support from his family and friends. Check out his donation page. This triathlon is prestigious because it is the biggest and most rigorous triathlon of its kind. It consists of a 2.4-mile swim, 112-mile bike ride, and a 22.6-mile run. The triathlon runs from 7:30 a.m. to midnight of the following day, giving the triathletes a total of 16.5 hours to complete the competition. Chris gives himself Friday off to take a break. Chris also has a swim coach, who helps him greatly with water-based athletic training, as it was not something he practiced competitively until this past winter. Lastly, he says to “respect the distance”, so be sure to train consistently and keep a great support system. Chris’ goal is to be able to combine Edith Sanford and I Want Smart to bring awareness to breast cancer and shed new light on the union. Chris says that he wouldn’t have been able to do the race without the help of SMART, as we have been able to support him mentally and financially through his journey. He reached out to SMART for help with fundraising and we were pleased to lend a hand. We’re extremely proud of Chris’ story and journey to the Ironman. Now we’re on a mission to share his story with the world. We look forward to following Chris’ journey, and we encourage you to follow with us. To support Chris, visit his donation page. To stay updated, follow our Facebook page. – Chris has reached his $3,500 minimum. Help him reach his goal of $5,000 on his donation page. – His training has increased to 15 hours a week and has remained injury free! – He will taper in the next few weeks, meaning that he will decrease his workout load to allow his body to recover and rest in preparation for race day. – He has completed his nutrition and consumption plan for race day. Best of luck Chris! September 25 will be here before you know it! You breathe 3,400 gallons of air a day on average. Indoor air quality is a topic most people pass right over, as they probably assume their air is as clean as they keep their home. However, you’d be surprised what hidden threats lie within it. Dampness and humidity from your shower can cause mold. If you have a ceiling fan in your bedroom, or anywhere else in your home, the dust and allergens that collect on the blades can sprinkle on furniture. Dust mites love to roam around furniture and carpets. Carbon monoxide can be produced from leaks and exhaust from your appliances. Radon can be produced from wall and floor openings that are in contact with the ground. Utilize these 8 very simple ways to ensure that your air quality is in top-notch shape. This is key, as it will prevent the buildup of dust and allergens. Not only should you replace your filters regularly, but make sure you choose an effective one. You want a filter that catches at least 85% of large air pollutants. Cut down on dust buildup by washing your bedding and vacuuming your carpet on a weekly basis. Kitchen and bathroom ventilation fans rid the air of pollution. Keep your humidity between 30% to 50%. Make sure your home is gas-free with a radon test kit. Have a carbon monoxide alarm installed and regularly test your home for this toxin. The easiest step of all! Get some fresh air circulating through your home to increase your air quality. Get the professionals to clean and maintain your HVAC units the right way. Get in touch today.